Be afraid. Be incredibly afraid…because the Monsters are here! One man starts to suffer from a strange affliction, as another seeks knowledge of the future – with dire consequences. A young boy gets more than he bargained for when he receives a unique Christmas present, while a lonely man battles creatures that live in the darkness. 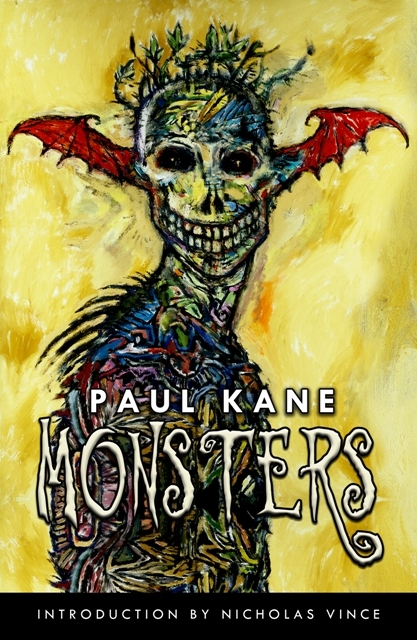 And as a rescue expedition finds strange animals in the jungle, one man’s wife returns from the grave to be with him once more… Vampires, werewolves, zombies, witches, this collection from the imagination of award-winning and bestselling author Paul Kane has them all! Including the first reprint of ‘Dracula in Love’ in over a decade, the original short story the movie Weeping Woman was based on and all three parts of the ‘Life Cycle’ trilogy (begun in the late ‘90s and concluding with the brand new ‘Lifetime’), plus an introduction by Nicholas Vince (who portrayed Chatterer Cenobite in the Hellraiser movies and Kinski in Nightbreed) and cover art by the legendary Clive Barker, this is one book you really should be afraid to miss! We also launched a very limited hardcover version of Monsters — signed and numbered and limited to just 30 copies. As an added incentive, each hardcover comes with a free DVD of The Weeping Woman film., directed by Mark Steensland.